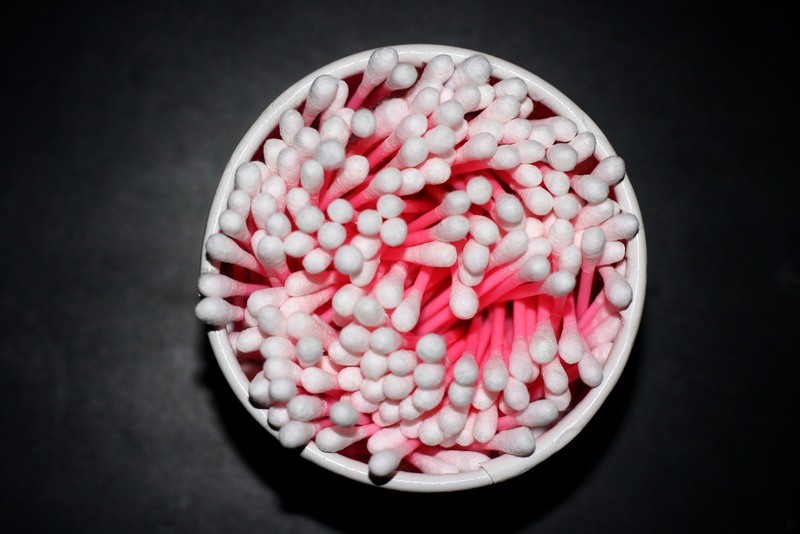 Ah, the leg-shaking pleasure of sticking one of those cotton-ended rods into your ear canal and rooting around to within a millimetre of self-inflicted deafness. The tantalizing brush with whatever it is that seems to be the only barrier between your rebellious bud-brandishing and your brain. I look forward to this part of my day. When there are no cotton buds, stepping out of the shower is not only shivery, but it’s a grave disappointment. How else to soak up that cold wetness that lingers in your ear than with the luscious multi-skilled Q-tip?! And I say multi-skilled, because ear-ramming is not all the trusty tip is capable of. It also blots, blends and corrects myriad make-up mishaps. What I want to know is who’s putting the little blighters up their nose? You have a perfectly good finger for that. Why did they include that on the warning? They did not feel the need to tell you to avoid poking it into your eye. Nose-budders, please own up. In fact, I did a little web-scan as part of my diligent research and I am rather upset by the outcome. 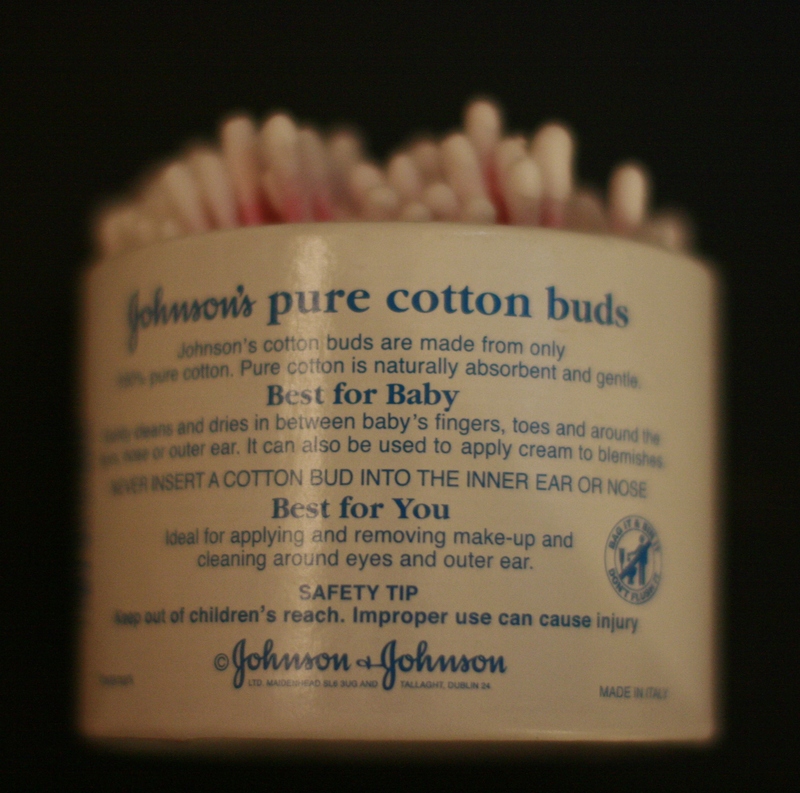 Apparently it is really quite bad to put a cotton bud in the ear. I knew it was supposed to be bad, but I didn’t realise how bad. And doctors around the world are fed up with boneheads who come to their establishments with all manner of things wedged in their ear. Of course, that thing separating your bud and your brain is of course your eardrum. And apparently it is possible to kill yourself if you perforate it with a Q-tip. Not like perforation equals death, but there’s a risk of infection that could lead to cardiac arrest (!) and then death. Phew, at least I won’t die instantly; instead it will be scary and painful and highly embarrassing. “How did she go?” “Earbud.” Heroic and noble this is not. The strange thing is, I am more deterred by the potential shame of becoming yet another nitwit before a frustrated doctor who has a proper illness to cure, than by death itself. I guess I am not convinced that this tiny little baby gay (yes, that was their original name, I kid you not) has such wicked or fatal intentions. But there are plenty of reasons (which I shan’t irk you with now) as to why the earbud should not be on one’s daily agenda. But trust me: it’s better to floss or flex than to poke or prod. Did you know that there are a lot of nerve endings in the ear? And many of them are hooked up to other parts of the body, especially the internal organs. Certain nerves that are in the skin of the ear canal connect to the intestinal organs (wow did you just learn something? Don’t get excited, I cut and pasted that from a real doctor). So it’s the classic, what you like is bad for you. It’s up to you to make the trade-off. And although I love this dear little drumstick, I have through the course of my post, turned. I have decided to forego the pleasure for a healthy, happy ear than risk the possibility of deafness or death. Call me straight, but baby gays will remain in my make-up routine only from hereon in. This entry was posted on Monday, January 30th, 2012 at 23:28	and tagged with cotton bud, ear, earbud, ENT, pleasure, Q-tip and posted in humor, J'aime. You can follow any responses to this entry through the RSS 2.0 feed. « Help! I’m Through to Automated Help. what good’s an ear if a Q-Tip isn’t in it? Firstly, “Baby Gays.” from now on I shall only ever be referring to these little glory sticks by this name. Just simply wonderful. Secondly, I have to own up and admit I am a nose budder, plain and simple. When you have fingers like mine, even the little pinky won’t fit! The term ‘glory stick’ deserves a medal and andrew it is true, you have the biggest hands of any man I know. I am starting to understand the nose budder, thanks for the insight. I try to use them as little as possible and so only de-wax once a month (is that gross?). Funny thing is, sticking a Q-tip in my left ear is practically orgasmic — my mouth hangs open and my eyes roll to the back of my head — but if I stick it in my right ear, I start choking. seriously, it feels like something is compressing my windpipe.